We wanted a way to keep our FRS (2-way) radios handy. We use these all the time. We take them into Wal-Mart (that way we don't have to stay together), into the mall, around campgrounds, and of course, we use them when we are backing into our site (along with hand signals). Danielle does the campground registration, so she grabs one when she goes into the office, in case she has to ask me something. 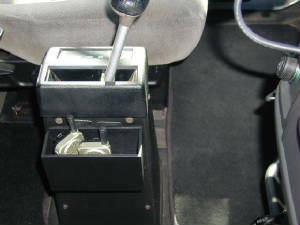 We first tried to velcro them to the side of the autoshift console. That "kind of" worked, but they kept falling off, or the velcro kept coming off the back of the radio. So, I built a little box to put them in. The box hangs from velro, and is sized to fit on the console without interfering with walking through. Our cell phone also fits into the box, although it is not shown. The entire thing works well.